Three rivers surround the original 1660 estate of Trois Rivières, the rivers: Bois d'Inde, Oman and St. Pierre. 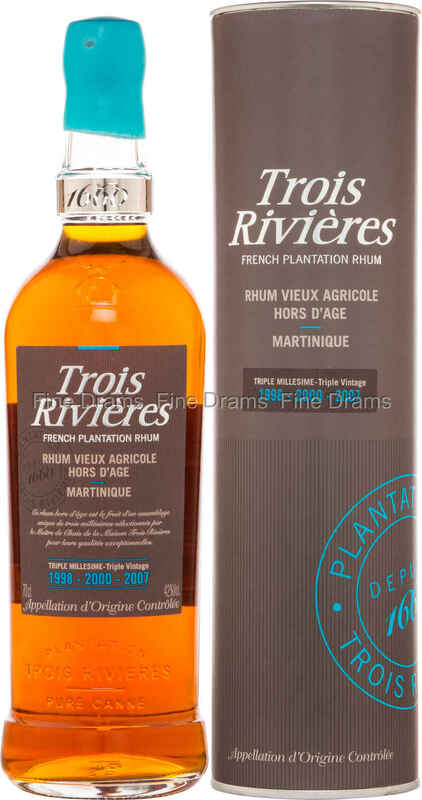 The same number of vintages can be found in this superb, well-aged Rhum Agricole blend, with spirit from 1998, 2000 and 2007 making up the blend. In the Caribbean heat of Martinique, with its accelerated aging, this is quite an old spirit. The rum has been matured in a mixture of French and American oak casks, producing a complex spirit. This rum serves up luscious, slightly funky grassy cane notes, with big, stone and orchard fruit flavours, particularly apricot. A little light oak and brown sugar appears, along with a touch of salted caramel and vanilla. A truly terrific Agricole, from a fantastic distillery.